With a population of over 90 million people, mostly composed of Millennials who are increasingly plugged in, Vietnam’s Internet economy has got great potential, and yet, fintech still remains a relatively untapped opportunity. 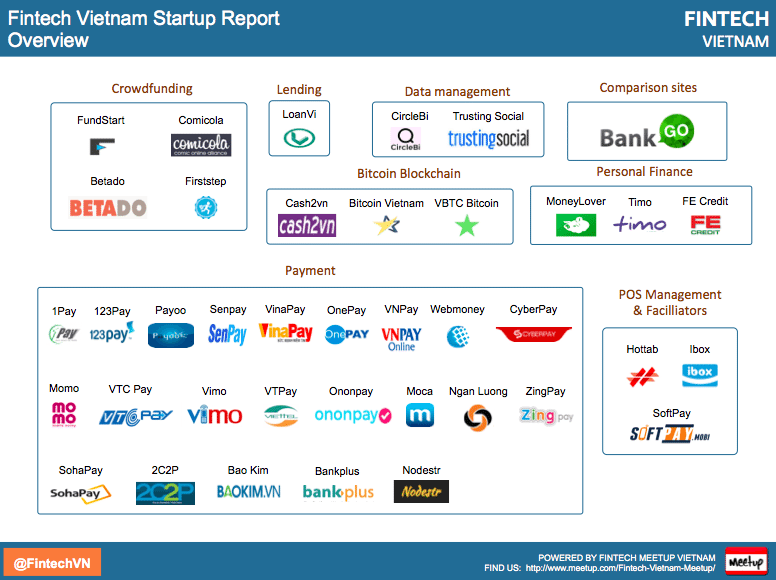 In an updated Fintech Vietnam Startup report, Fintech Meetup Vietnam explores the current state of fintech in Vietnam and highlights the key factors that are making Vietnam an attractive market for financial technologies. Vietnam’s fintech industry is still in its infancy with a little more than 30 players who are mostly tackling the payments market. Two thirds of Vietnam’s fintech startups are providing consumers and merchants with, either, online payments services (1Pay, 123Pay, Payoo, VinaPay, OnePay, MoMo, etc. ), or, brick-and-mortar digital payments solutions and POS/MOS (ibox, Moca, etc.). The appetence for online payments and digital wallets in Vietnam is no surprise since Southeast Asia is expected to see its e-commerce market boom in the next decade. Thankfully, not all of them are offering payment-related products and services. Vietnam has also a number of ventures that are tackling all kinds of sub-segments including crowdfunding, with players such FundStart, Comicola, Betado, and Firststep; lending with LoanVi; data management with CircleBi; personal finance, with the likes of BankGo, MoneyLover and Mobivi; bitcoin with Bitcoin Vietnam; and banking, with Timo, the country’s first digital bank. While fintech is still in early-stage, some players, including local entrepreneurs, Internet and mobile providers, but also foreign investors, are starting to understand the untapped opportunity here. 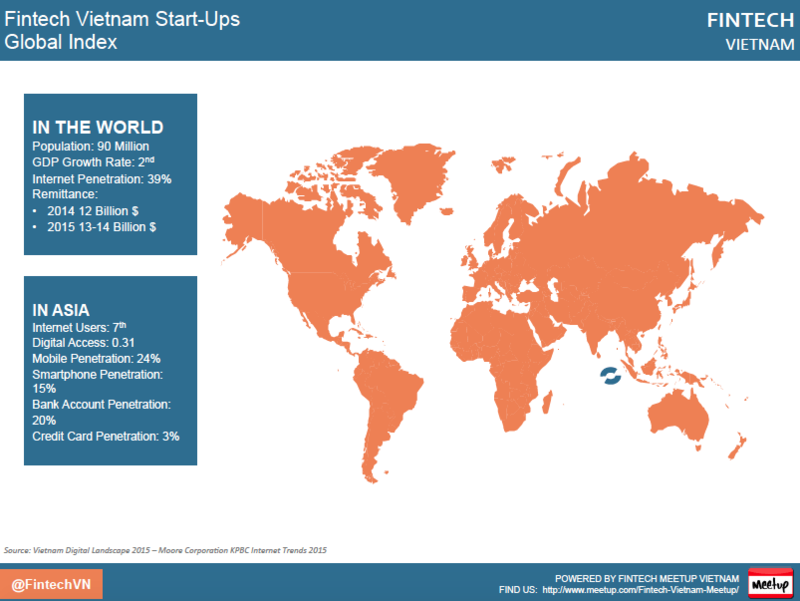 Globally renowned startup funds, incubators and accelerators, have started eyeing the Vietnamese market as well. 500 Startups launched in March a US$10 million micro-fund for Vietnam as it intends to invest in 100 – 150 domestic startups. Foreign ventures, too, have started expanding to Vietnam notably to tap into its remittance market. Vietnam, one of the busiest markets for receiving remittances in Asia, received US$13.2 billion in 2014, accounting for 6.4% of the country’s total GDP in that year. WorldRemit, a UK-based startup, has just announced the expansion of its Vietnamese product, launching in May a new cash pick-up service enabling customers to collect cash instantly from 218 branches of DongA Bank. A new player that has recently launched operations in Vietnam is Tapp Commerce, a Finish company that has developed and which operates a payment processing platform and a peer-to-peer commerce network that connect merchants with unbanked consumers in their neighborhoods. Meanwhile, Vietnam’s fintech startup FTP Wallet has just launched a new digital wallet for online shoppers dubbed V-FPT that comes with an escrow feature. FTP Wallet is a joint venture between the country’s leading information technology company FTP, and the group’s online shopping unit, Sendo.vn, one of Vietnam’s leading e-commerce platforms. While basic financial products and services have low penetration rates in Vietnam, with 20% in terms of bank accounts and 3% for credit card, Vietnam remains a highly attractive market for innovative financial services companies. This is mostly due to one particular element: the country’s young and hyper-connected population. Vietnam ranks as the 7th country in terms of Internet users and has a mobile penetration of 24%, and a smartphone penetration of 15%. These trends represent a real opportunity for companies that are offering business models based on digital platforms. Timo, for instance, launched a couple months ago the country’s first digital bank. The company already managed to on-board 4,000 customers in Ho Chi Minh City alone, a traction that demonstrates that locals are indeed interested in mobile and online banking. In a recent interview with Fintechnews, CEO and co-founder Claude Spiese, said that his company is planning to open a so-called Timo Hangout in Hanoi to start offering services to residents of the capital city. He is targeting more than 50Mio Vietnamese. So, Vietnamese don’t have payment cards, eh? Well, not for long. Singaporean MatchMove Pay launched last year its flagship product in Vietnam: a digital wallet that allows any major brand to issues a digital payment card. Last year, the company partnered with Mastercard to offer mobile, virtual, and physical payment cards not just in Vietnam, but across Southeast Asia. Some of them are brand new (Nodestr, Timo, BankGo), others we haven’t yet covered in the old report. Contact us anytime if your startup is not on the list. Comicola is a crowdfunding platform in the cartoon industry. The company has its own website and a distribution system which is teeming with activities to engage young artists, writers, and readers. Comicola, which also offers courses in applied comic art in Vietnam, has forged increasing partnerships with local artists and comic illustrators. Who do you think the market potential next decade?